Thread connectors are used to join 2 pieces of threaded material together where a longer fixing is not available or suitable. 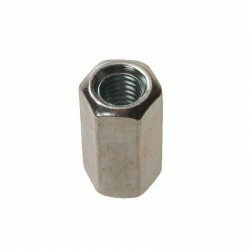 Most commonly used to join lenghts of threaded bar together to make longer lengths than are widely available, they can be used with almost any fastener. The length of a threaded connector can usually be found by multiplying the thread diameter by 3.